This is one of my favourite photos I took during the groom's preparation at Kortright Centre. As a wedding photographer, I am always looking for moments I can immortalize for the bride and groom. Fortunately, on this special day, newlyweds families surrounded them with plenty of emotions. First, the groom's parents offered me several opportunities to capture splendid candid photos during the groom's preparation for his wedding ceremony. Next, the groom's sister expressed freely her emotions towards her younger brother. Finally, two of the groom's nieces were also flower girls on the wedding day and showered the groom with kisses and hugs. 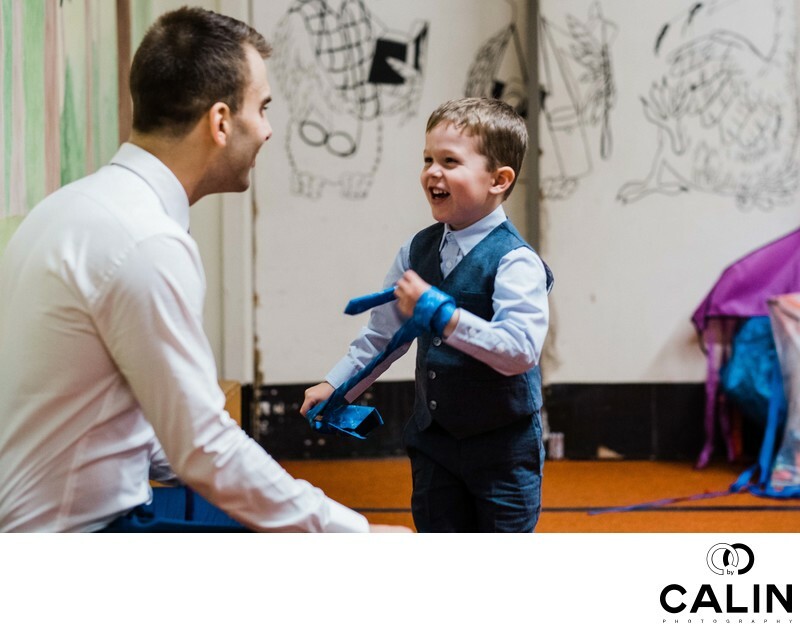 In this particular image, the groom was trying to help his nephew tie his tie and the little one started teasing the groom and playing with his tie. What makes this picture special is the genuine expression of happiness on the kid's face. I love those situations were unaware of the presence of the camera, children behave normally and are not shamed in expressing their true feelings. In this particular wedding photo I plied several techniques I will enumerate now. First, I borrowed a street photography method that allows me to shoot from the hip. In essence, what I do is pre-focus on an object at the predetermined distance. Afterwards, I switch to manual mode and I position myself at the same distance from my subject and pretend to observe another scene. In such scenario, my subject is not disturbed by my presence and acts naturally. When I noticed something that deserves being photographed at just press the shutter button without raising the camera to my eye. This technique allows me to shoot multiple candid photos without being observed by anybody. In terms of composition, the subjects in this image are placed on a line parallel to the sinister diagonal. That gives this photograph dynamism and dimension. I know many wedding photographers in Toronto don't necessarily care about composition and technique. According to them, the most important thing in photography is emotion. Actually, I beg to disagree. While in motion is definitely one of the most important factors in creating a splendid image, one has to take into consideration the light, composition, movement and other elements. Only when at least a few of them align can a photographer create a beautiful image that stands out. To capture this image I use the 56 mm F1.2 Fujifilm lens mounted on a XT2 camera. In order to keep this photograph candid, I used only the ambient light and did not turn on the flash that would have alerted the subjects of my presence. In this particular gallery I experimented with a new post processing technique. Namely, I used a preset I recently purchased and I could say I am very pleased with the results. The skin tones look natural and the overall look of the photo is filmic. Kortright Centre is one of the most unique wedding venues in Toronto. Usually couples book this location 12 to 16 months in advance in order to secure the date for their big day. The magnificent forest, the greenery, and more make this one of the most sought after venues in the area. It is not uncommon for the establishment to host two or even three outdoor wedding ceremonies at the same time so if you want to get married here do not hesitate to call them now. You will be impressed with the quality of the services, the food and the overall experience not to mention the uniqueness of the location.